2014 allowed me to see how investing time in something I am truly passionate about can open up new possibilities and even more creativity in many aspects of my life. 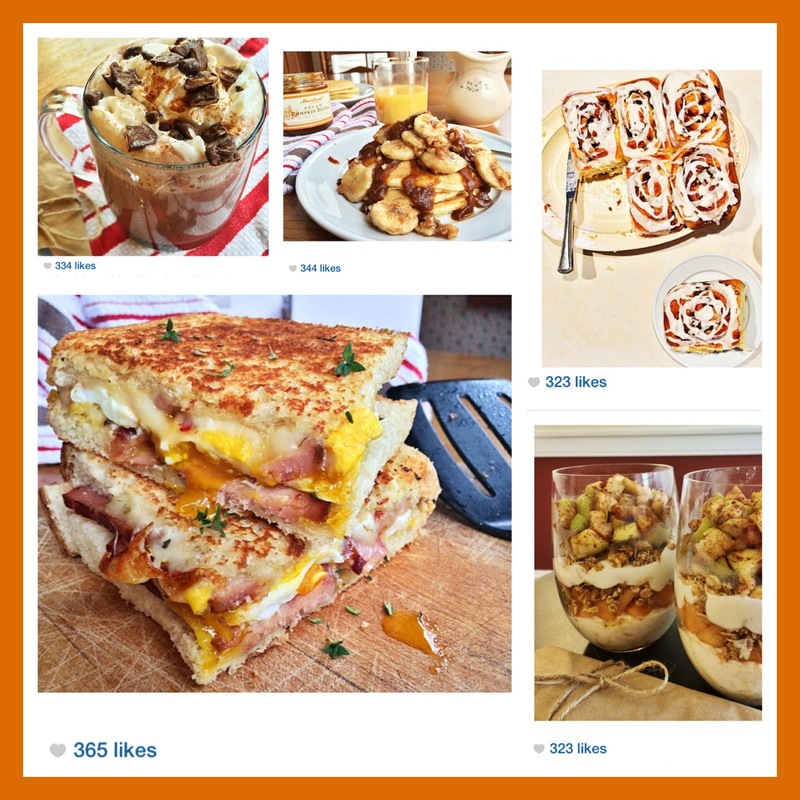 When I started “Breakfastwithbex” in March of 2014 as a spontaneous food Instagram account, I truly never expected to be ringing in the new year with my own website address: Breakfastwithbex.com. Having something you love grow into a gateway for networking, a way to bring smiles to thousands of people and something that drives you to get up in the morning is pretty fulfilling to say the least. I hope that in 2015 you are able to discover that one niche, which you enjoy regardless of the amount of time or money you have to invest in it because in my book, loving what you do is more important than anything else. Oh (rein) deer, what do we have here?! 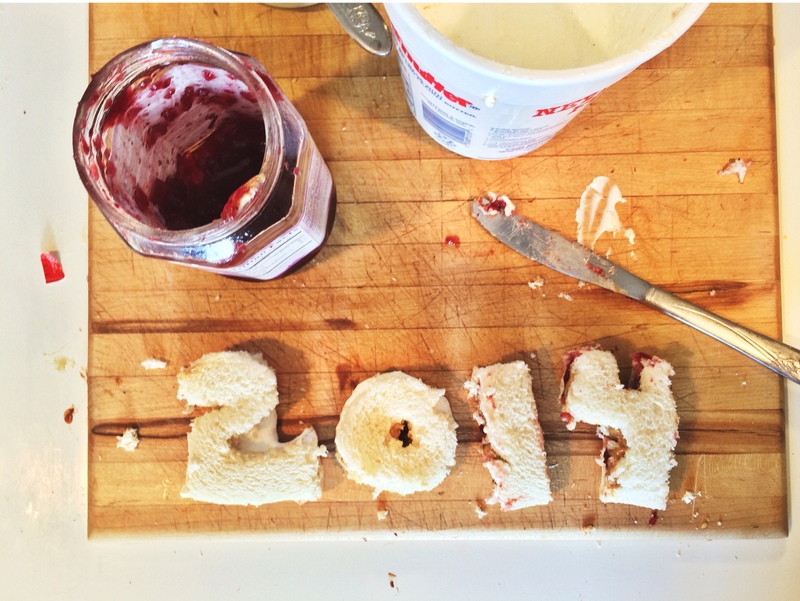 The last lunch of 2014 called for some celebratory PB&J and PB&fluff sandwiches. 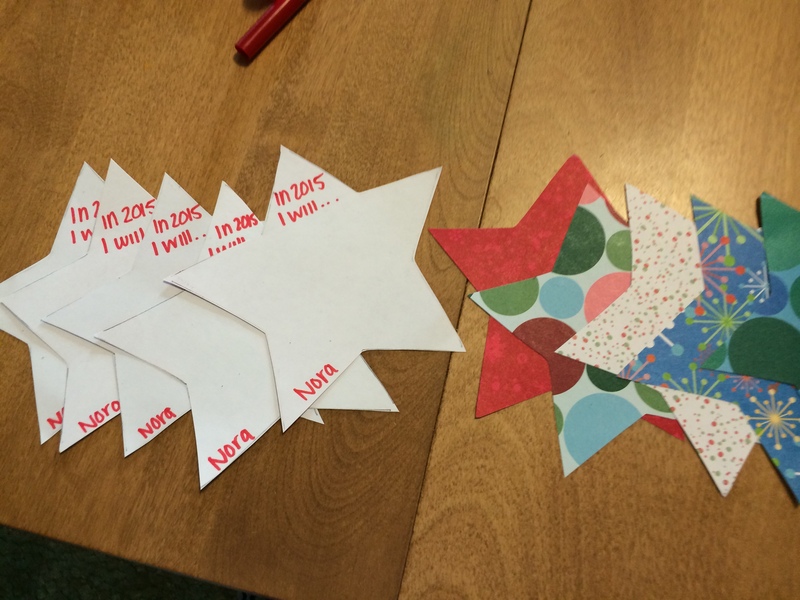 “Bex’s New Year’s Resolution Activity” in which I gave each of the girls 5 stars to write 5 resolutions on and then place in their decorated 2015 paper bags. Fun, fun, fun! 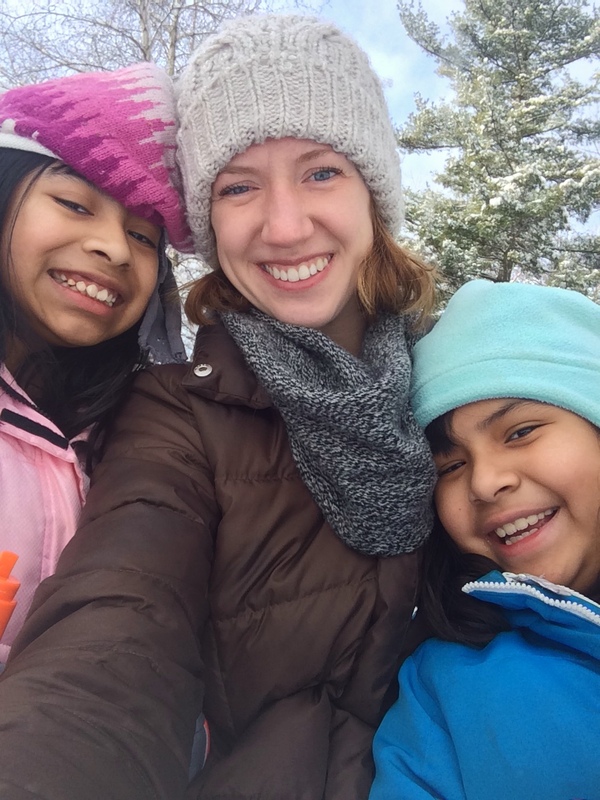 The snow came just in time for us to experiment with Nora’s new snow paints and make the greatest sledding path of all time in the backyard. 2014 was a great year, but I myself have some resolutions to make for 2015 as well. In just 20 days I will head to Washington, D.C. to take part in The Washington Center program for the spring semester. I cannot wait to start the year off with the excitement of an internship at The Library of Congress, a different environment full of new friends as well as new brunch joints, and the opportunity to further my journalism aspirations in a beautiful city. To kick-start the new year I decided to try something that Breakfastwithbex has never made before: crepes. 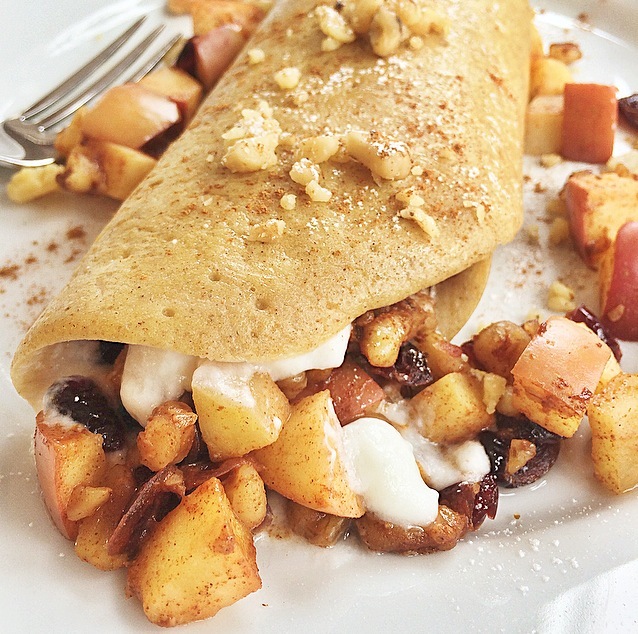 Experimenting in the kitchen to create these pumpkin spice crepes with a caramelized apple, craisin, walnut and Greek yogurt filling was a fun way to start the first meal of 2015! Melt a little butter in a crepe pan or frying pan over low-medium heat. Meanwhile, whisk crepe batter together until smooth. Pour batter into pan and let cook about 1-2 minutes until crepe sets. Then flip and cook other side of crepe. This makes a decently thicker crepe so if you would prefer a thinner crepe, just make two with this given amount of batter! In a separate pan begin warming diced apple, craisins and walnuts on low-medium heat. After a minute add lemon juice, orange juice, and cinnamon. Mix the filling with a spatula to evenly coat the apple chunks. Cook for 2-3 minutes until apples are soft and mix is caramelized. Line your crepe with two dollops of Greek yogurt down the center. Then spoon your caramelized medley filling atop the yogurt. Fold up your crepe, sprinkle with a little powdered sugar and bon appétit! Previous Post Who’s bready for next Christmas?! Next Post Will you berry me, Breakfast Blueberry-Nut Oatmeal? !